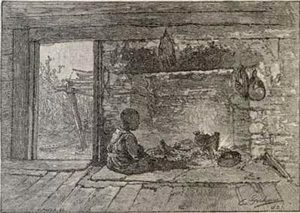 When you got to the plantation (a big farm) after the slave auction, someone would tell you which cabin to sleep in. You shared that cabin with a lot of other people. 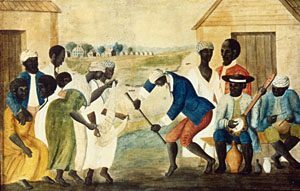 Enslaved African-Americans picking cotton. See the little girl? 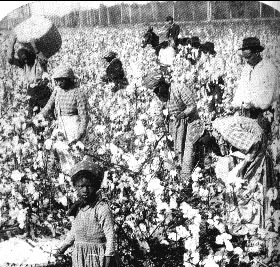 During the day you worked in the fields, planting or hoeing or picking cotton. At night you ate corn mush, sweet potatoes, peanuts. You got whatever your owners had left over or didn’t want to eat, like turnip greens or pig guts. People learned how to cook these leftovers so they would be good to eat. But most people were hungry and tired all the time. After you got married, you lived in a cabin with your husband or wife and your kids. You had to work all day. So an older woman or someone who was disabled would take care of the kids – but often not very well. One terrifying thing about being enslaved was that your owner, or the overseer, or any free person, could beat you whenever they wanted to. These people could torture you, or embarrass you, however they wanted. They didn’t have to have a reason. 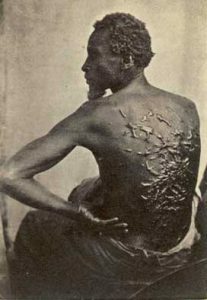 Another awful thing about slavery was that your owner could take your husband or wife or kids away from you any time he or she wanted. Your owner could just decide that you should have a different husband. And that would be that. Or he could decide to sell you, or your wife or your child, to someone who lived far away. You would probably never see your family again. Cite this page: Carr, K.E. What was it like to be enslaved? American history. Quatr.us Study Guides, August 14, 2017. Web. April 20, 2019.